Biryani is one of my all time favorite dish. Growing up in Singapore, you get all types of cuisine to choose from. And i remember my dad taking orders from everyone for our weekend biryani luncheon. I personally love having Fish Biryani. However, i've grown to like Chicken Biryani as well. When i first moved to the United States, my knowledge about cooking was very limited. I'd make simple and easy food which almost requiered nothing. And part of it also had to do with the fact that i was home sick and missed my family and friends dearly! But as years went by, it gave me more and more confidence to try new recipes and learn from my mother in law and mom in Singapore. And it's still a learning process. Sometimes my mother in law and mom would ask me for recipes :). And it feels great to be learning and sharing my experiences with my loved ones. 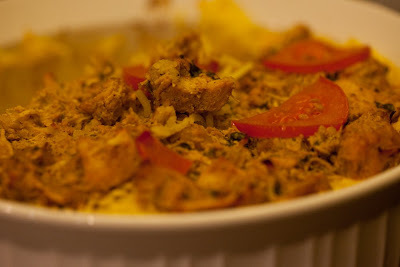 So here's my all time favorite Chicken Biryani recipe that i learnt from my dear Mother in law:) She's an amazing cook and a great inspiration to me. 1) Marinade the cubed chicken in the above ingredients and let it sit in the fridge for about 4 hrs. i usually marinade extra chicken and freeze the extra in a ziplock bag. That way, the next time i want to make more biryani, i have my chicken marinated and ready to go. 2) In a large pressure cooker, heat up some oil/ghee and add the marinated chicken . Add another 1 tbsp of ginger. garlic and chili paste to the marinated chicken. Stir well and pressure cook chicken for about 15 to 30 mins on low. Chicken should be well cooked and tender when you open the pressure cooker. 3) Heat some oil in a separate pan and add some cloves and cinnamon sticks. Add 2 chopped up medium onions and saute till they are golden brown. 4) Add the sauted onions into the cooked chicken along with 1/2 cup of yogurt , 3 tbsp of chicken masala, 1 tsp turmeric powder and 1/2 cup chopped cilantro. Mix well and taste for seasoning. - 2 cups of basmati rice, washed and soaked for 1/2 hr. 1)Cook rice in a rice cooker with some ghee, salt and saffaron. 2) When the rice is cooked, remove the rice cooker lid and let the rice cool a little. 3) Place the cooked chicken on top of the rice followed by the sliced tomatoes. The tomatoes are to give some moisture and flavor to the rice. Put as many or as little as you'd like. 5)Cover the baking dish with some foil and bake it in the oven at 375 for 1/2 hr. 6) Serve hot with some yogurt on the side.